Some analysts believe large dealer groups could be well placed to survive the downturn. Two of Europes biggest dealer groups are restructuring their businesses to protect themselves against the slump in new-car sales. Inchcape is the second- biggest dealer group by revenue in Europe and employs 6,000 people in Britain and a further 11,000 in the rest of the world. It will cost Inchcape £85 million (about 96 million euros) through restructuring and writedowns in 2008. This means the company will save £55 million annually. Pendragon -- the third biggest dealer group by revenue in Europe -- issued a profit warning in November 2008. It has implemented measures including stock reductions, cutting payroll by nearly 20 percent and closing 75 dealerships in the last 14 months. Neither company would comment in detail on their plans when Automotive News Europe contacted them. Giorgio Elefante, an analyst at PricewaterhouseCoopers corporate finance division, said big groups are seeking to shrink their footprints by reducing the number of outlets they have. He said it could be argued that large dealer groups are better placed to survive this economic downturn than their smaller counterparts. My view is that if big ones are professionally managed, they should be better equipped because they can close down and reduce work forces and can be more effective in the selling exercise than smaller ones, he said. Porsche Holding is Europes biggest dealer group with 2007 revenues of 11.8 million. In an e-mail reply to questions, Kurt Loidl, executive director at Porsche Holding, told ANE that his companys approach was to reduce stocks and to adapt its structures to the new market conditions. Peter Bosch, a consultant with Oliver Wyman, said large groups such as Porsche Holding are under less pressure as they are strong financially thanks to their success over the last 20 years. Sales in western Europe are expected to fall to 11.3 million units in 2009 compared with 13.6 million in 2008, according to market researcher J.D. Power Automotive Forecasting. 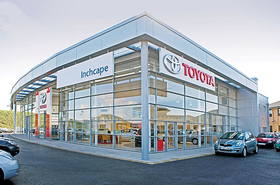 The impact is already being seen in the UK where dealers such as Inchcape are restructuring. The company will also write down £20 million on the goodwill value of its newly acquired Latvia business, due to continued weakness in the Baltic states, the Web site telegraph.co.uk reported. In a statement, Inchcape CEO Andre Lacroix said the company was not immune to the current industry slowdown. Inchcape will continue to benefit from its unique business model as we maintain our strategic focus on customer service and growth in the emerging markets, he said. The dealer group, which issued a profit warning in October 2008, says it hopes to make an annual cost reduction of £50 million as a result of the restructuring. Pendragon said it expected to report a 2008 full-year loss of £30 million before exceptional items because of the economic downturn. Volvo confirmed that Pendragon is closing eight sites across the UK due to the current economic crisis. Nigel Ruddock of Grant Thornton financial advisors warned that dealers need to make sure they have cut costs as the economic crisis continues. Ruddock, head of the automotive team at Grant Thornton in the UK, said: From a dealers point of view, if youre doing your 2009 forecast and looking at your cost base, what youre looking at is a 25 percent to 35 percent drop in new volumes. Ruddock said there was hope in aftersales opportunities for dealers. He said while people will tend to defer buying a new car, they would be the ones who need a car serviced in three or four years time from a franchised dealer. Ruddock said dealers would then be in a position to take advantage of the aftersales opportunities. He said that because the current economic crisis is global, it is difficult for manufacturers to divert products to other markets, unlike the more localized crisis that hit the auto industry in the 1990s. His advice to dealers and manufacturers for this year is to make sure they have scaled back. That means fewer people, and tightening procurement and energy costs as well as marketing. Dealers also have to market to people they do not usually appeal to. Charles de Marcilly, European public affairs director at CECRA, the European dealers association, said banks need to help dealers to buy cars from manufacturers. CECRA is hoping the economic downturn will spur new-car sales because automakers will offer more attractive deals.